University-provided bunk beds and lofted beds provide more functionality in compact living spaces. It is important that the safety features of these beds are used as designed. UCSC's bunk and loft beds come equipped with built-in safety rails. Safety rails are not to be removed or tampered with. Residents are not allowed to convert existing provided furniture into loft or bunk beds. Residents who modify their provided furniture are subject to possible fines and student conduct action (See section IV A 5 b of the Terms and Conditions of residence). 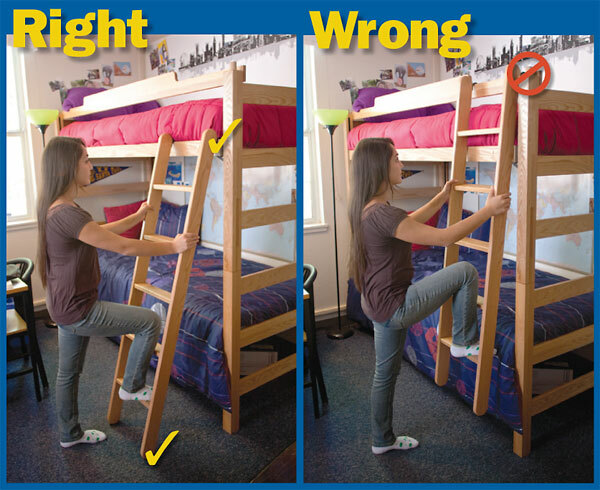 Ladder must be placed firmly on the floor with hooks secured to the bed frame to ensure stability. Neither ladder hooks nor safety rails are designed to support the weight of a person and may fail and result in injury if used improperly.